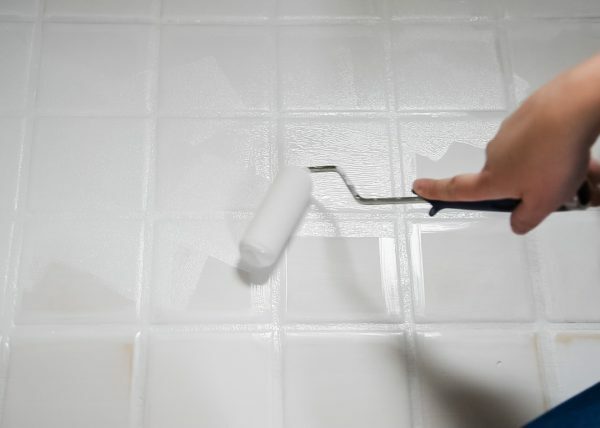 Floor paint is a quick and easy way to update your bathroom tile on a budget! 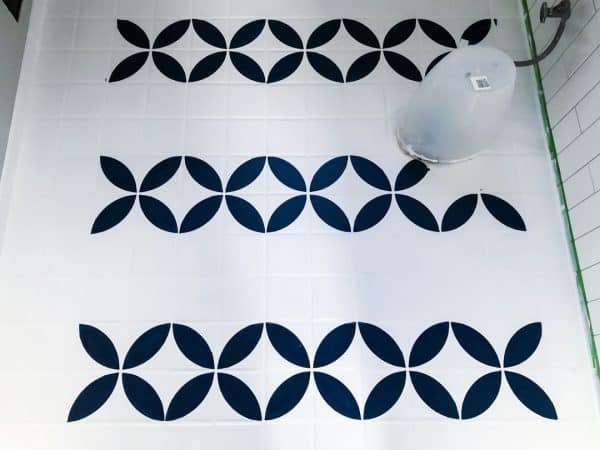 Find out how to paint tile floors with a bold stencil design! This week in my DIY half bath remodel, I’m painting the tile floor to give it a whole new look on a budget! I had my heart set on a bold, geometric pattern that would add wow factor to this tiny space. But the cost of cement tile is outrageous! Instead of shelling out $15-30 a square foot, I’m painting the entire floor with a stencil for the same price. 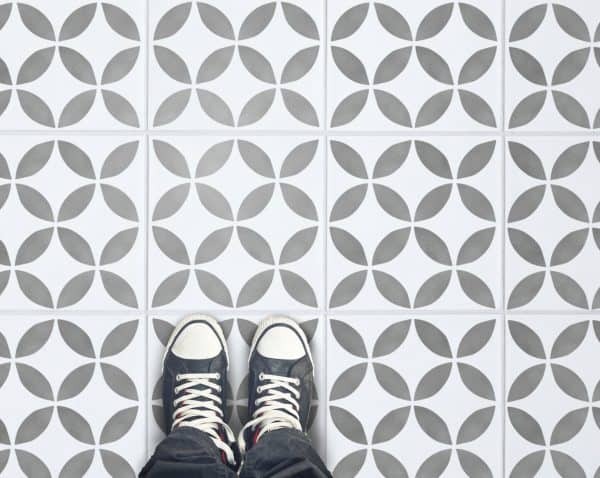 Cement tile in bold patterns are all the rage right now, but they come with a hefty price tag. I fell in love with this Moroccan style tile with a simple geometric pattern that wouldn’t be too overwhelming in the small space. But it would cost over $500 for a measly 30 square feet! I was worried about matching the navy blue color to the vanity I had already purchased. It’s the only pop of color in the entire space, and I wanted to get it right. Luckily, Behr’s floor paint can be tinted to match anything you desire! I felt a little crazy bringing the mirror from the vanity set into Home Depot to be color matched, but they assured me that they do this sort of thing all the time. They scanned the mirror frame and produced the perfect can of navy floor paint for my project! I also bought a can of bright white Behr floor paint as the base color. This paint is incredibly weather resistant (it’s meant for painting concrete patios! ), so the rest of the gallon will be my go-to white paint for outdoor projects. 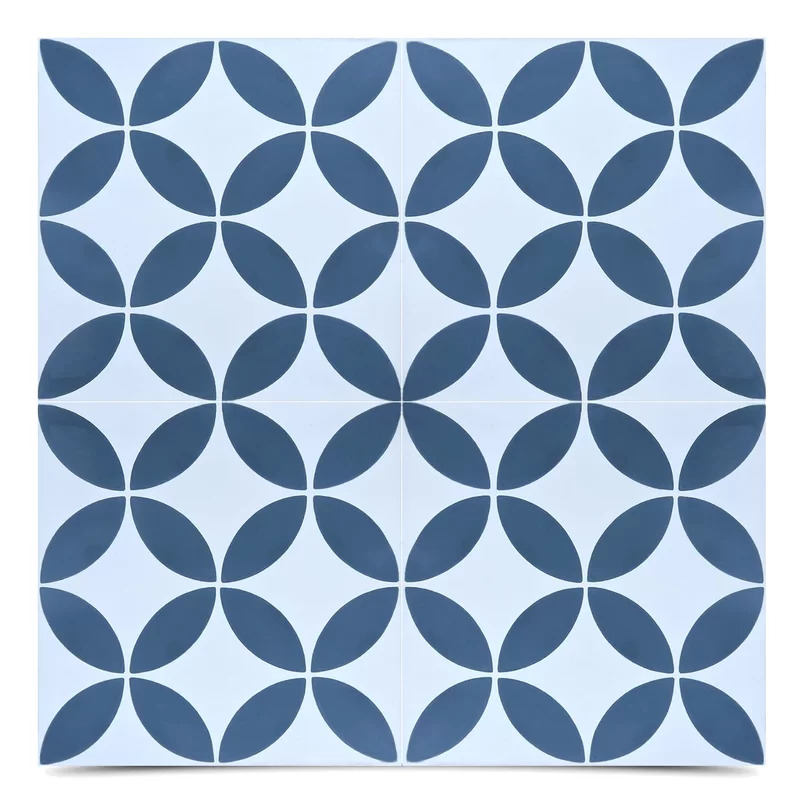 I found an exact match to the pattern of my inspiration tile! 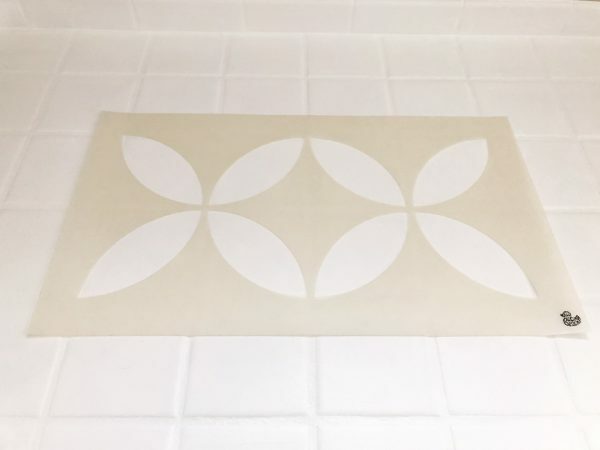 This Etsy seller custom sized the stencil to the exact dimensions of my tiles, including the grout lines. As an added bonus, they sent a second stencil for free, so one stencil can soak in soapy water while I keep painting with the other. I bought the extra small x6, which covers six eight tiles in a single stencil to save time and effort. 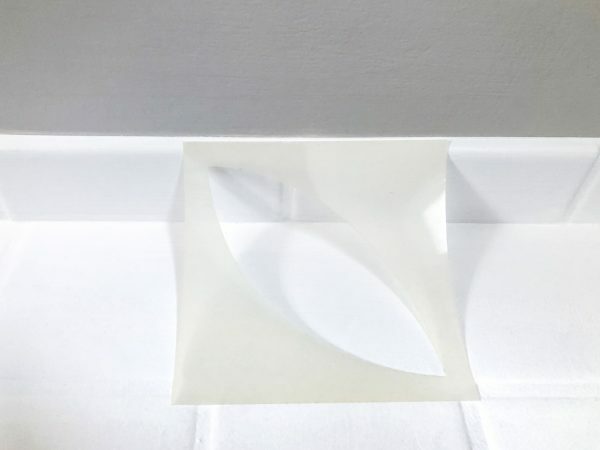 In addition to customizing the size of the grout lines, the seller also changed the design so that a single “lobe” would fit on each small tile. 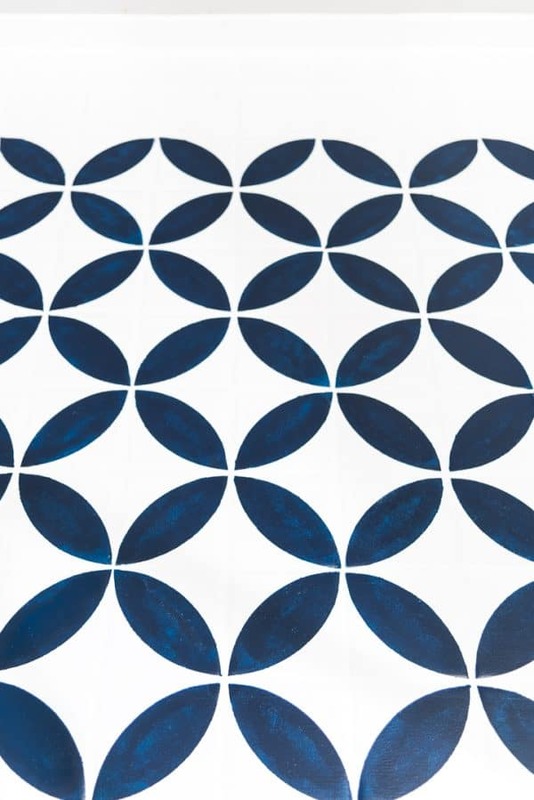 The larger pattern will prevent the floor from looking too busy. I also ordered a single “lobe” stencil for the corners and edges of the room. This smaller stencil will be easier to bend and manipulate to fit into tight spaces. 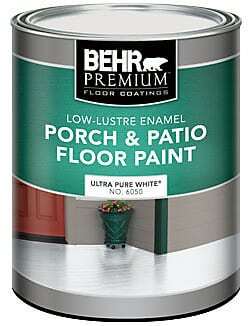 I went with Behr Low Lustre Porch and Patio paint for its good reviews and the ability to get it custom tinted. This stuff will keep the floor paint adhered to slick tile! I used this one, but any primer that will bond to tile works. A corner sander will help get into tight spaces and corners without resorting to hand sanding. You can get the one I used here. This is the most important step of the entire process! 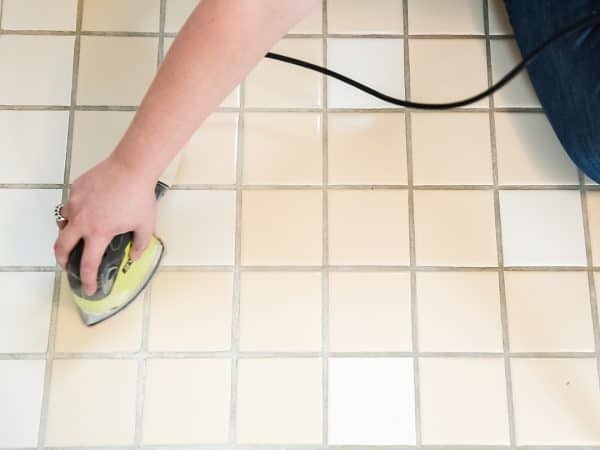 If you don’t prep your tile floors properly, the floor paint won’t stick and you’ll have wasted all that hard work. 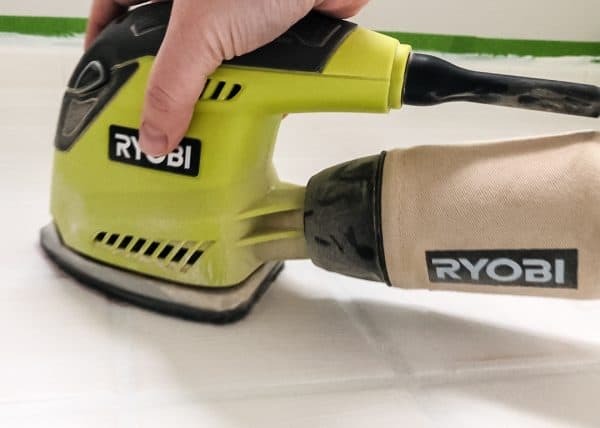 Start by sanding your tile floors with an orbital sander and 80 grit sandpaper. This will remove some of the sheen and rough them up so they will accept the paint better. Next, give your floors a good cleaning! 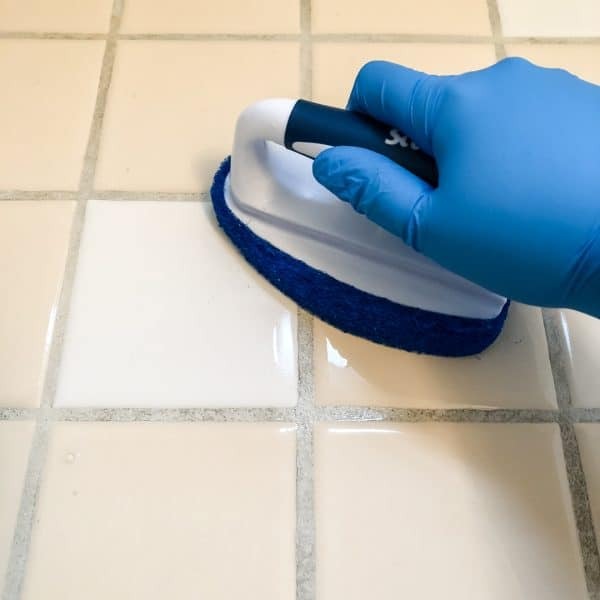 I used TSP, which is a heavy duty cleaner and degreaser that will remove any dirt, mildew or soap scum from your tile floors. Make sure to wear gloves when using this stuff, because it will “degrease” your hands and dry them out! I scrubbed my floors twice to make sure they were super clean. First, I used an extra grout sponge I had bought for installing the vertical subway tile. Then I went over it again with a scrub brush, concentrating on the grout lines. Rinse the floor with clean water afterwards. 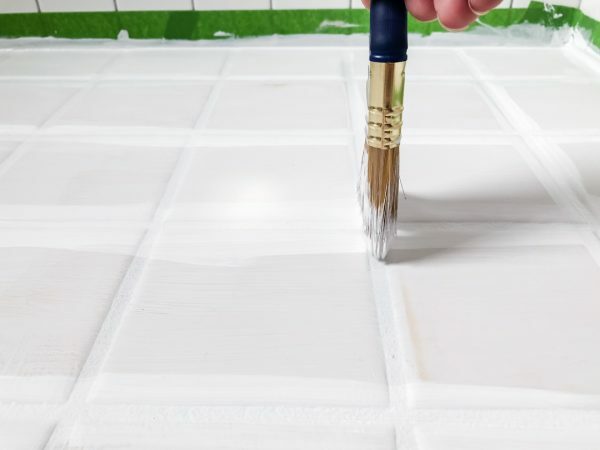 Once the tile floor is dry, apply painter’s tape to the walls and any areas you don’t want to be painted. I decided to keep the tile “baseboard” that was already around the perimeter of the room, so I taped off above it. This stuff is thick, sticky and makes paint bond to almost anything! I used a good paint brush to apply the bonding primer to the grout lines first, then the surface of the tile. I had originally planned to use a roller, but the bonding primer is so thick it was hard to roll. Let the bonding primer dry overnight, then lightly sand the surface smooth with 220 grit sandpaper. This will remove any brush marks and thicker spots. Remove any sanding dust with a tack cloth. This bright white floor paint matches the subway tile on the wall, as well as the sink in the vanity that will be installed shortly. But you can choose any color you want! Work in small sections to prevent areas from drying too soon. Start applying the floor paint with a high quality paint brush in the corners and edges. Then run the paint brush down the grout lines. Then go over the tiles with a foam roller. 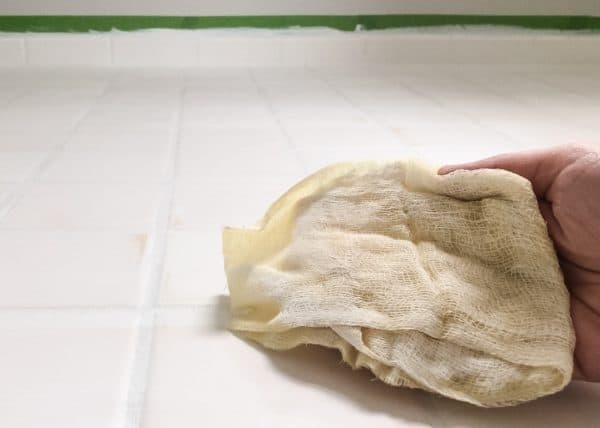 Roll from different angles to make sure every edge of the tile is coated. 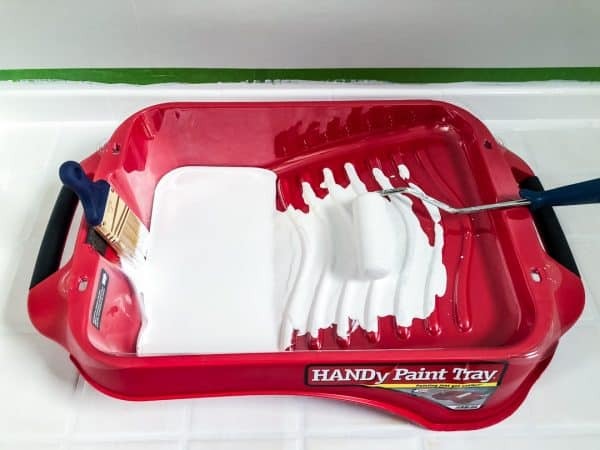 HANDy Paint Products sent me their paint tray and liners for this project. It was perfect for switching back and forth between paint brush and roller. 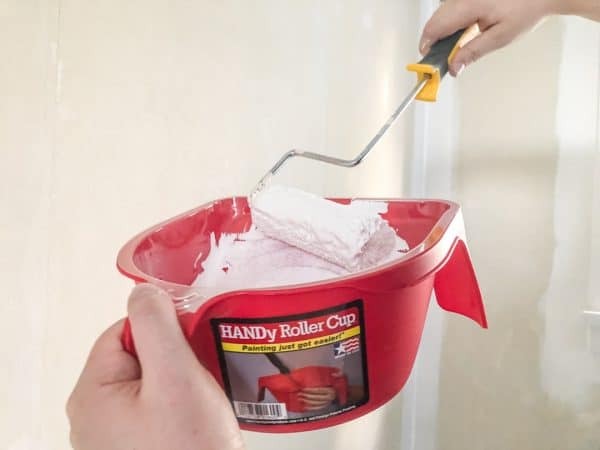 There’s a magnet on one end so you can hang your brush out of the paint and let it drip back into the tray while you use the roller. 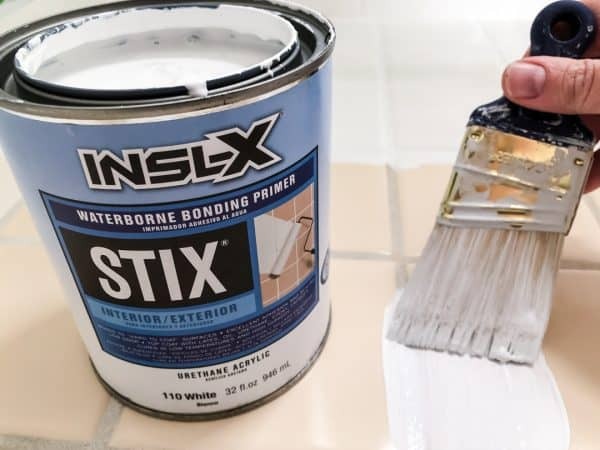 Allow the first coat to dry for 3-4 hours, then apply a second coat the same way. It was looking pretty good already! This was the moment I was most excited AND nervous about! I’ve used stencils before, like in my bread box makeover and this Let it Snow sign, but nothing this permanent! 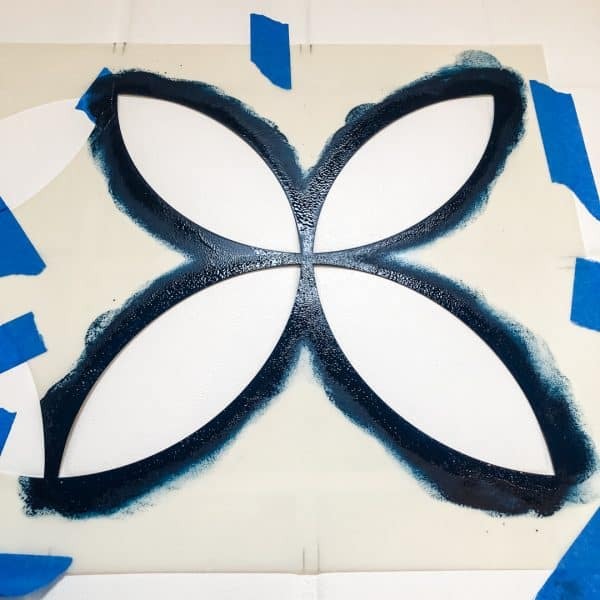 Use painter’s tape to hold the stencil design in place. The center of the four lobes is positioned over the grout line between the four tiles. The key to getting a clean stencil image is to use as little paint as possible. I kept a roll of shop towels on hand to dab excess paint off the foam stencil pouncers. Dab the edge of the stencil in an up and down motion, building up the color slowly. 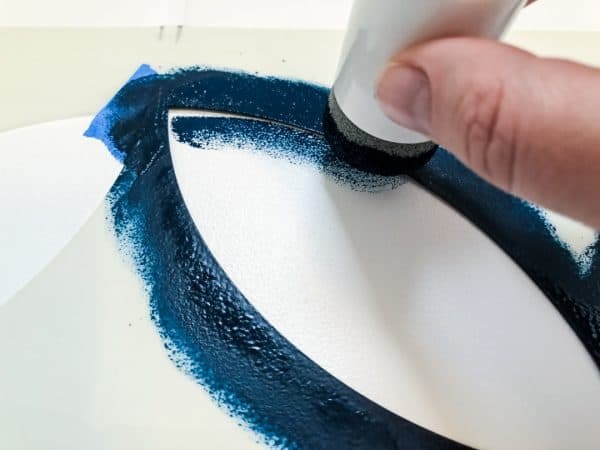 If there’s any bleed through, touch up those areas with a flat artist brush. I’m waiting until the entire floor is complete and dry before I go over the edges with the white base color. 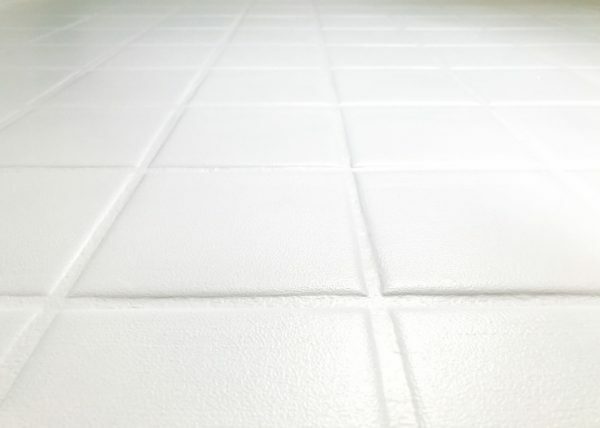 I painted one section of tiles, then skipped the next to allow the paint to dry. Otherwise the edges of the stencil could mess up the paint! Luckily, this bathroom floor is really small, so it didn’t take long to stencil almost the entire space! I’ll trim the stencil to fit around the outside edge of the tile and finish up tomorrow. The floors weren’t the only thing I painted this week! I also gave the ceiling and crown moulding a fresh coat of my favorite ceiling paint by Benjamin Moore in Decorator’s White. The walls were primed first, since I’m pretty sure they’ve been covered in wallpaper since the house was built! There’s not much space in here, so I used a smaller roller with the HANDy roller cup. It was so convenient to have a roller tray right in my hand! Then I painted the room the same color as our living and dining room, which happened to coordinate with the wall tile grout nicely. I’m in the home stretch now! All I have left to do is install the vanity and fixtures, then add a few decorations. There’s still two weeks left of the One Room Challenge, and it’s so refreshing to not feel stressed at this point! Really good alternative! Great work! It’s gorgeous Vineta! I pinned this! Thanks for sharing at the To Grandma’s House We Go DIY, Crafts, Recipes and More link party. Hope to see you again next week. Great tutorial. Thanks for joining us for Friday Favorites. I’m featuring you this week. Aw, thank you so much! I’m glad my tutorial was helpful! 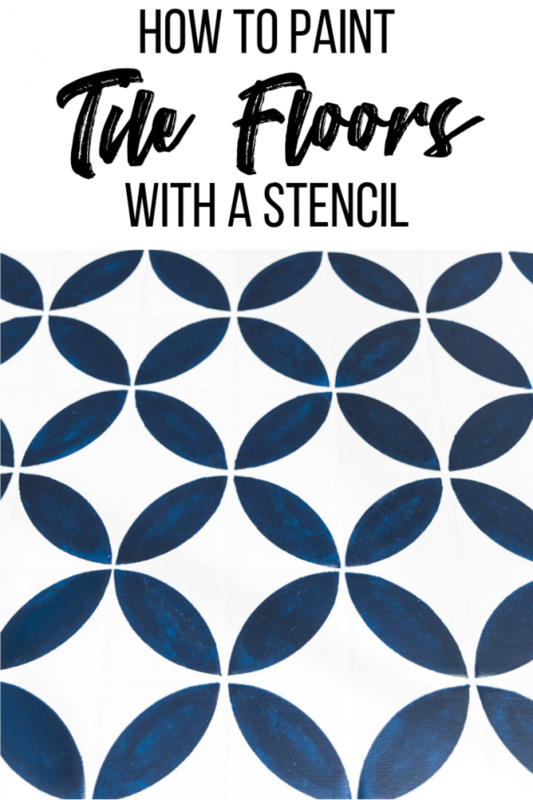 sealant to prevent chipping of your lovely stencil? You can coat it with polyurethane if you want, but I haven’t had any problems with chipping yet!